​on the northern reaches of the Kaimai Ranges at Tirohia. Kaimai Wind Ltd is proposing to install up to 24 wind turbines on farmland at the northern end of the Kaimai Ranges. 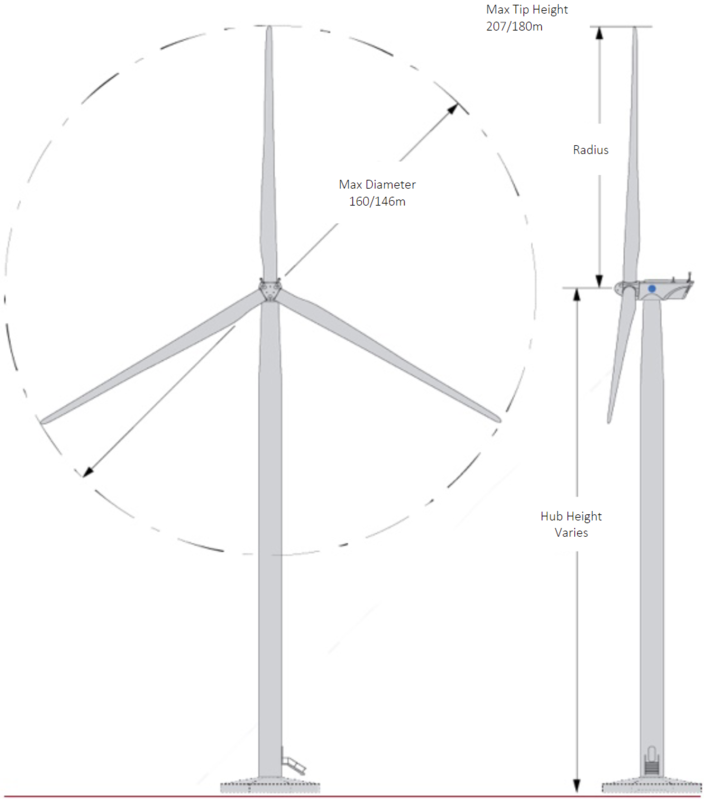 The proposed turbines, which are of two different models have a hub height of 110m and 130m . The turbines have three rotor arms with a diameter of 146m and 160m respectively. The total hight when measured from base to the tips, equate to 180m and 207m respectively. ​The site is privately owned and farmed by three separate landowners. The grid connection will be via the existing 110kV lines that pass over part of the landholding. Kaimai Wind Ltd has been investigating the wind farm potential of the Northern Kaimai Ranges since 2005. The initial viability analysis involved installation of a 20m tall monitoring mast along with access and grid connection investigations. Once these initial investigations showed positive results, a bird, bat and wildlife investigation commenced in in 2007. Investigations are ongoing, adding to a significant database which records bit, bat and wildlife activity in the area over consecutive years. Landscape and Visual – photo-montages and visibility analysis. Background Noise – installation of sound meters and modelling of noise propagation. The Kaimai Ranges has special significance to Maori and we have worked closely with local Iwi to understand their concerns – consultation is ongoing. The proposed site is strategically placed to improve security of supply to the major demand centres of Tauranga, Hamilton and Auckland. Wind Energy is well suited to complement the hydro resource of the Waikato Region as it is possible to store energy (as water) behind dam walls. When the wind is light water can be released to fill the demand. The site was chosen after a regional investigation for the best sites. To be successful, a wind farm needs to have a strong, consistent wind resource and be close to the existing electricity network. The location needs to be easily accessed (for construction and maintenance), and has to be of sufficient size for economies of scale. Kaimai Wind Ltd has engaged in wide consultation with the Paeroa community over the period of investigation. You can read about this, and other research and investigations in the Q&A. ​The application for a resource consent to construct the wind farm has been lodged with the Hauraki District and Waikato Regional Councils. After scrutiny the application will be publicly declared, giving the public access to the range of reports and opening the opportunity to lodge submissions. Please don’t hesitate to contact us (via the contact form on this website) if you have any questions or concerns.